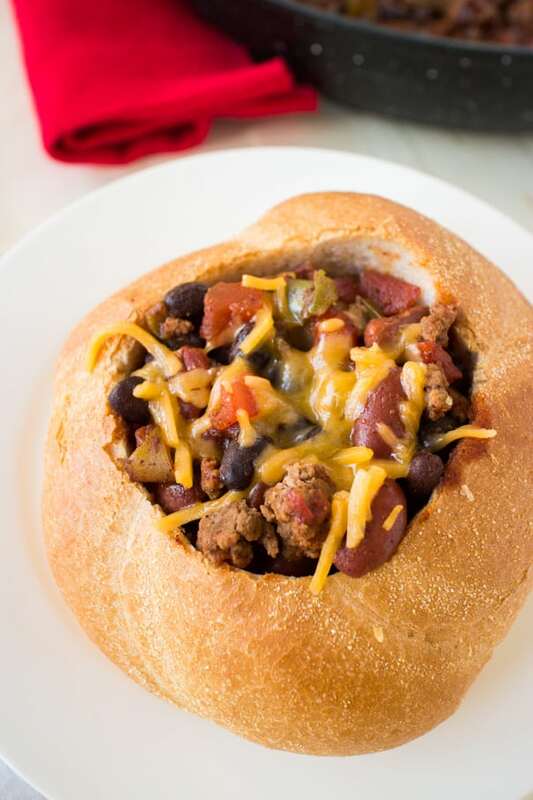 Easy Ground Beef Chili Recipe With Bread Bowl - Classic and Quick! The base of this recipe is ground beef. I recommend using a 90% lean beef that won’t make your chili greasy. You should brown your beef alongside garlic powder, green pepper and onion. As soon as you start doing this, your family will already be running to the kitchen wondering what smells so great! 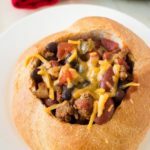 In addition to the ground beef, you’ll need the other key components of a great chili: a delicious tomato sauce, diced tomatoes, kidney beans and black beans. 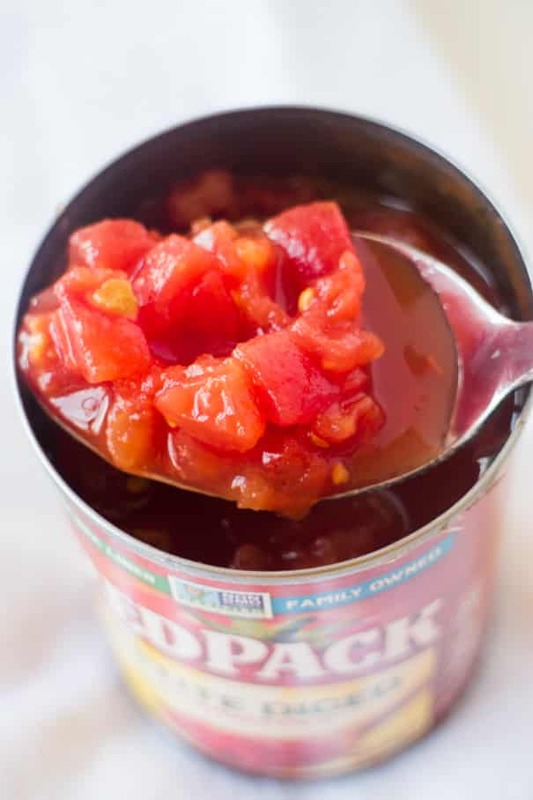 For my tomato sauce and diced tomatoes, I always use Redpack Tomatoes. Their tomatoes are family owned, grown and made – for over 75 years, the brand has partnered with family farms they personally know. Their mission is “to provide the freshest, best tasting tomato products in the world” and that’s what you’ll taste in the chili! Their tomatoes are steam packed fresh, with nothing artificial and proudly made in the USA. 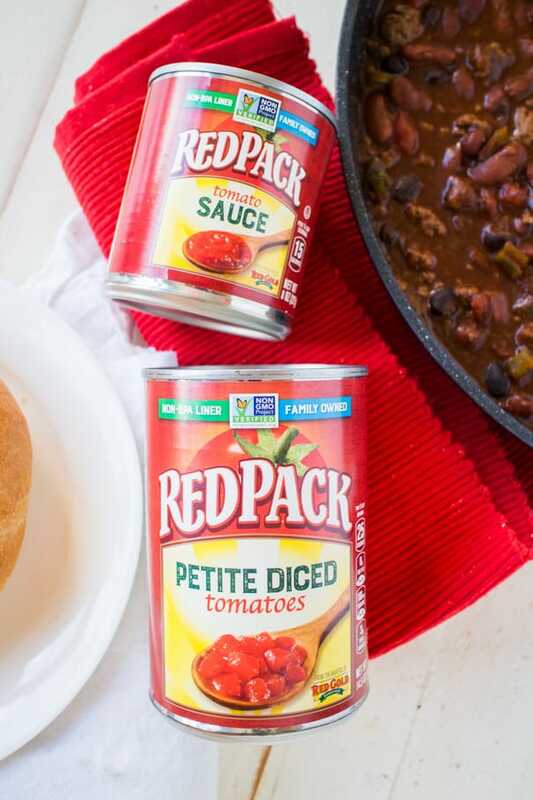 Because a good chili needs a good tomato sauce, trust the difference family makes when it comes to taste! The tomato sauce in this chili recipe adds a nice creaminess, perfect for eating with a spoon on a chilly night! Instead of using broth, like some chilis call for, the tomato sauce is going to thicken up the entire meal, perfect for serving it in a bowl. Do you live in the Midwest? Check out Redpack’s sister brand Red Gold Tomatoes for products with the same family grown quality in your area. 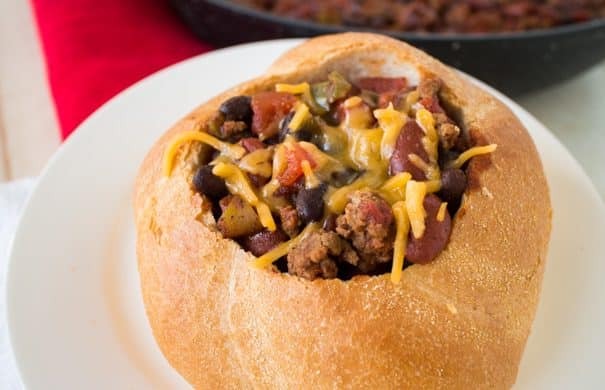 You could serve this easy chili in a regular bowl, sure, that would be delicious, but to take it to the next level, put the chili in a bread bowl. This is a sure way to make your family happy, because you can all dip the bread right into it. Who doesn’t love dipping bread into chili? I sure do! 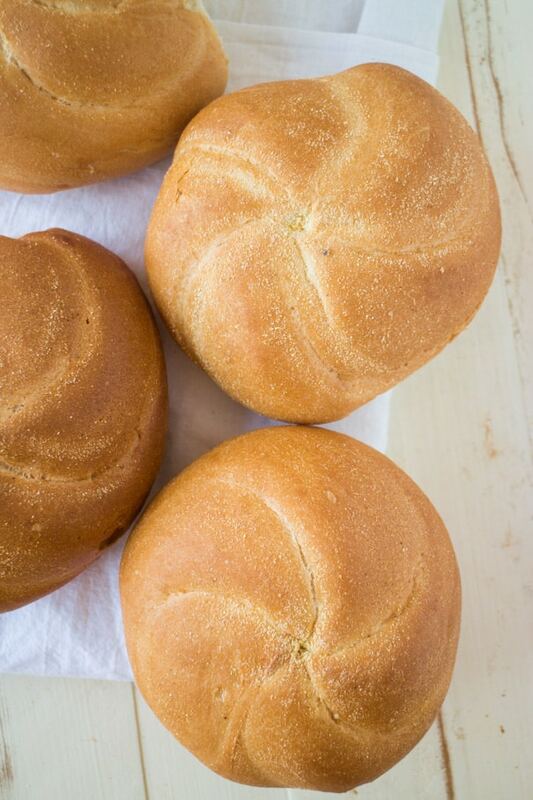 To make easy bread bowls, you will need Kaiser sandwich rolls. 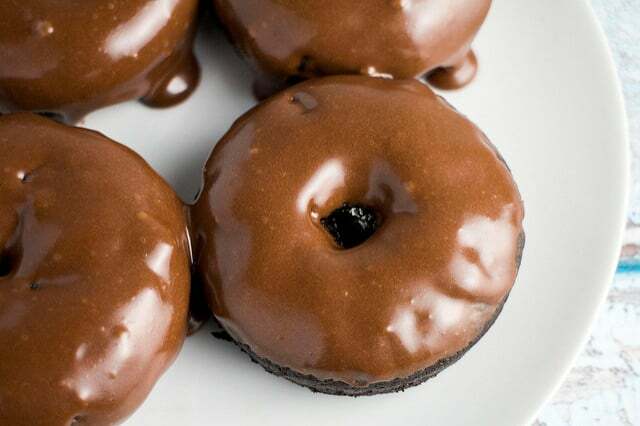 You can usually find these in the bakery section of your supermarket and they’re cheap – my bakery sells 4 for $1! What a steal! 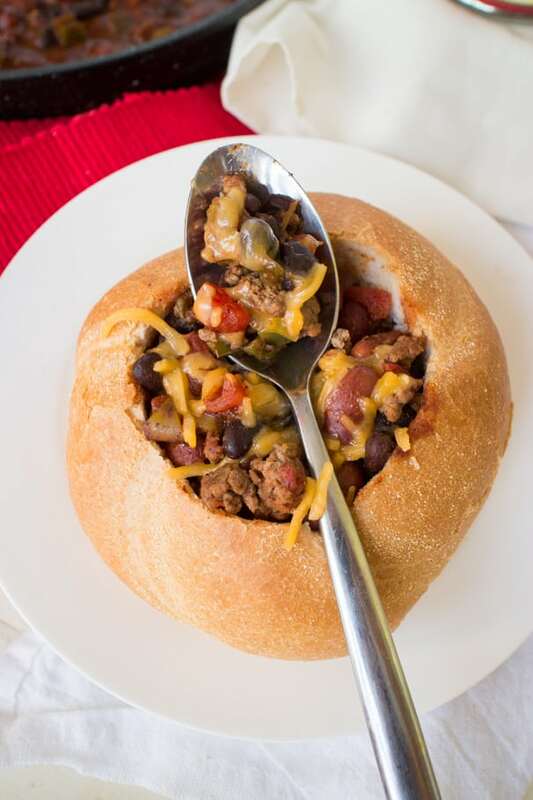 Then carefully, with a knife, cut out a circle on top of each bread bowl, but not too close to the sides otherwise the bread bowl will cave in. 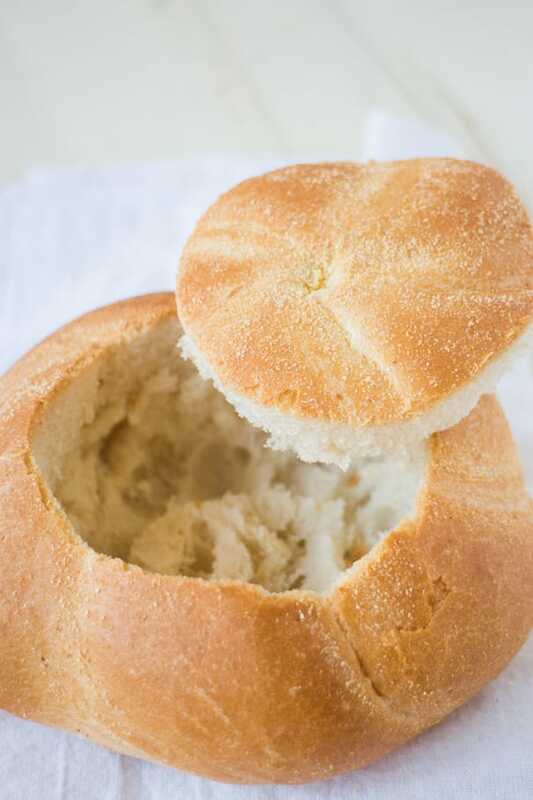 Remove the circle and the bread that’s connected inside the Kaiser roll. And just like, ta-da! You have a bread bowl. Then comes the best time – time to dive into this Easy Ground Beef Chili! I hope your family loves it as much as mine does! Add ground beef, garlic powder, onion and green pepper to large pan. Cook beef on medium high heat until browned. Add in diced tomatoes, tomato sauce, kidney beans, black beans, salt and chili powder, mixing to combine. Cook on high heat, simmering for 10 minutes, allowing some of the liquid to boil off. 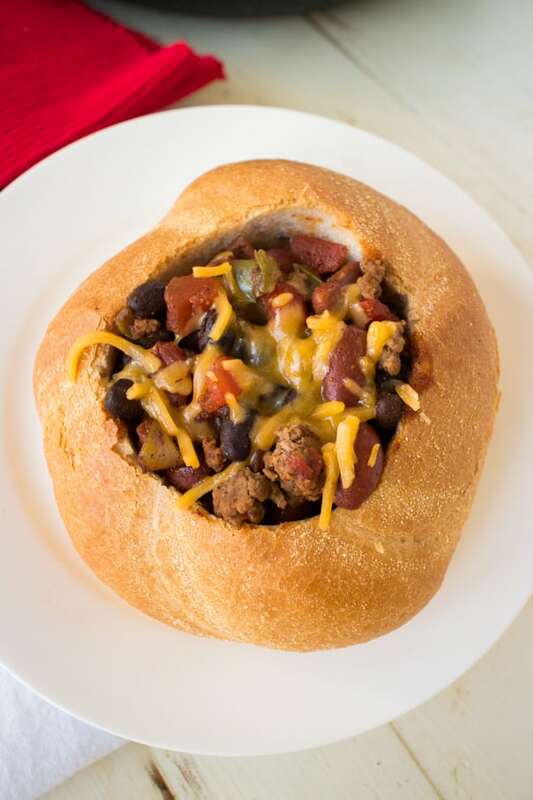 Cut open kaiser rolls to use as bread bowls and scoop chili inside of each. Optional: Top the chili off with shredded cheese and a scoop of sour cream!